The Avia Men's Back Cage Athletic Shoe is a perfect style hitting the gym or going out on the town. A lightweight, comfort bottom gives you all day support. A comfort midsole and stretch back collar provide an easy on/easy off style that you'll want to wear all day. This is a great show for walking and running extremely comfortable..
Great Shoe for the Price! I got them a half size bigger than what I usually wear because they didn't come in wide widths, and they fit perfect. I use them for tennis and walking. It was a good value. Very satisfied with this purchase so far. 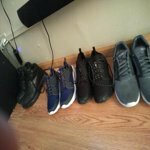 I buy all "my" shoes from Wal-Mart on line and from in the store. those shoes are comfortable. so Wal-Mart there have it keep the shoes ah-coming!!! I bought these on clearance. The pros: unbelievable comfort, aesthetic looking, they work well for running, they can easily be converted to a slip on with the bungee shoe laces. Cons be very careful tightening the shoe laces because it can damage the material holding the shoe laces, the shoe laces add very little to the shoe as the shoe is almost a slip on without them, they run wide. If you have a narrow foot like me this could be a problem especially since the laces can't be tightened significantly. Overall though the shoe is worth the regular price and was a steal for the five dollars I purchased them for. Minus the one star because the shoe laces can't be tighten very far at all without causing damage to the lace holes. Otherwise great shoe. You get what you pay for. Definitely lower end sneaker but were ok for extra pair of shoes. Kind of cool unusual style. Ran wider than expected. Were bought for a boy who has very little. He tried them on and loved them. He said they were very "cushy". He also loved that they were so light. First "unbrand" sneakers I have ever bought but they seem to be perfect for him.